Anxiety has enveloped the office of the Lagos State Traffic Management Authority in Agege after the zonal commander, Akeem Badmos, was whisked away in a Black Maria. Apart from Badmos, the zone’s Head of Operations, Saheed Olowu; a female official, identified as Sade; one Davies, and two other officials, were also reportedly arrested on Wednesday. They were all detained at the Oshodi office of the Lagos State Task Force on Environmental and Special Offences (Enforcement) Unit for allegedly impounding a commercial bus allegedly owned by a top government official. 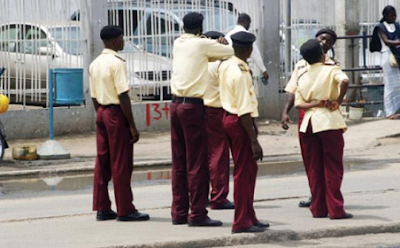 But LASTMA stated that the arrest had no connection with the ownership of the bus, saying that it was a sting operation aimed at curbing the illegal activities of some officials in the zone. Punch Metro learnt that trouble started around 8am on Wednesday when some LASTMA officials arrested the bus, with number plate, FKJ 772 XA, in the Abule Egba area for traffic offences. The bus conductor was accused of leaving the door open and hanging on the corridor of the vehicle. A source, who is conversant with the matter, told Punch Metro that 30 minutes after the vehicle was impounded at the agency’s office in Agege, the LASTMA General Manager, Wale Musa, stormed the premises and ordered the arrest of the officials. The source said, “The general manager initially sent the Provost Marshal, Mr. Femi Ajibosho, to find out if the vehicle was on the premises. Five minutes after, the GM drove into the yard and started videoing. He said he was called from Alausa in respect of the bus. But what I learnt was that the bus actually belongs to a senior government official. Another source said the officials were quickly released on Thursday after Davies slumped in the custody of the task force, adding that he was on admission at the Lagos State University Teaching Hospital, Ikeja. “Davies slumped early today (Thursday) and others were quickly released from detention. He is now in the Emergency Ward at LASUTH. This is sheer oppression. This is the same agency that gives officials targets to meet,” he added. The spokesperson for the task force, Taofiq Adebayo, said the agency had nothing to do with the case, noting that the officials were detained on the order of LASTMA. However, the LASTMA spokesperson, Mahmud Hassan, said the arrest had nothing to do with ownership of the bus. He said some officials in the area were notorious for illegal activities, which informed the raid. He said, “Some of the officials in that area are notorious and it has been giving us a headache. Their actions are not in tandem with the philosophy of the agency and the training given to them. There was a kind of sting operation there. They were set up because of their past operations. They were caught red-handed and arrested. “They have been released on bail. Investigation continues and the matter will be dealt with in accordance with Lagos State Civil Service rules. The story around the bus is totally over the bar. “We have surveillance unit and provost unit, which monitor the activities of our men and they can apply whatever style they deem fit in line with the civilised methods. » R*ped. Impregnated. Shot: 19-Year-Old Girl Has Baby For Boko Haram Commander!! !